Pack even more performance into a new Legacy 3.6RS with an STI Performance Kit. With a 10% increase in power and torque*, as well as enhanced handling and responsiveness, they'll go fast. And at only $59,990*, they'll go even faster. *Vehicle testing and development is carried out in New Zealand under controlled conditions. Offer based on 2018 Subaru Legacy 3.6RS at RRP of $54,990 with STI Performance Kit at special price of $5,000 incl. 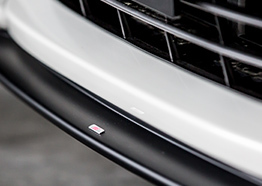 fitment (valued at $8,000) for a total cost of $59,990 incl. GST. Excludes lease, government and rental purchases and on-road costs. Accessories included are only those outlined on subaru.co.nz/offers/sti. Offer is not in conjunction with any other special, discount or promotional offer. Available at participating dealers only. Available until 31st December 2018 or while stocks last. Subaru reserves the right to vary, withdraw or extend this offer. Get down to the details. Compare the standard Legacy 3.6RS with the added STI Performance Kit features by dragging the slider across the images. Front lip spoiler - In addition to improving handling at high speed, this aerodynamic spoiler adds style to an already good looking vehicle. It manages airflow passing around and below the front bumper, generating downforce. With improved stability during high speed cornering, it also gives an added sense of security to the driver. The black spoiler also includes the STI emblem. Front mesh grille - The front mesh grille is designed to protect the radiator and engine, but that doesn’t mean it can’t be stylish too. The Legacy STI Performance pack features a tightly knit mesh which brings a sophisticated look to the Legacy 3.6RS and enhances airflow into the engine. Flexible tower bar - The STI flexible tower bar enables lateral rigidity to improve cornering whilst it’s unique flexible centre section allows vertical flexibility to absorb up-thrust from the road surface. Linked to both the left and right front suspension towers, this enhances the drive quality of the Legacy 3.6RS. 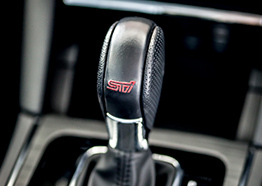 Push button start - This STI Start Stop button takes ignition to the next level. The Legacy 3.6RS is equipped with keyless entry and push-button start, with the STI button adding to the sporty interior. Oil filler cap - The STI oil filler cap has been specially designed to be used with ease even when wearing gloves, and when it is too tight, the special service holes under the resin cover allow you to use a wrench to loosen. 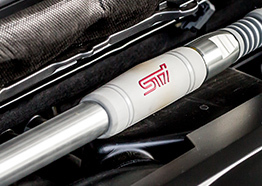 The silver aluminium base with embossed black cap showing the STI logo adds functional sophistication to the engine compartment. Shift knob - Featuring a punched leather grip, this shift knob with two types of genuine leather provides a strong and secure grip and feel. It is a part befitting the Legacy, allowing the driver to effortlessly move between automatic and manual mode with the Subaru Lineartronic Transmission. Front and rear cross drilled brake rotors - STI front and rear cross-drilled brake rotors have been added to the Legacy 3.6RS to increase the responsiveness and performance when braking and increase the handling with reduced unsprung mass to reflect the performance expected from an STI Performance model. 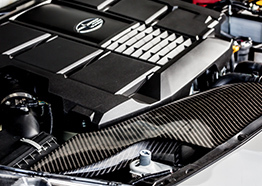 Carbon fibre air intake - The genuine carbon fibre air intake works in conjunction with the front mesh grille to take the power output of the 3.6L boxer engine to a new level. The motorsport inspired design adds detail to the engine bay. 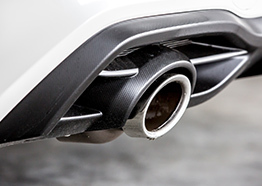 Sport rear mufflers - This high-performance muffler has lower back pressure, lower airflow resistance and makes the engine more responsive in acceleration. The exhaust sound has been specifically tuned to reflect the sporty yet refined character of the Legacy 3.6RS equipped with STI Performance kit. 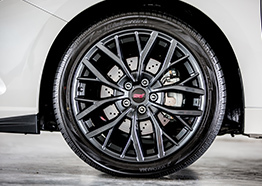 19” alloy wheels - Bigger is better, and the Legacy 3.6RS with STI Performance kit is no exception. 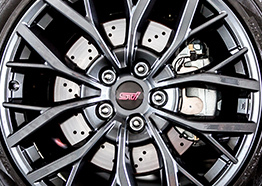 With STI embossed supersized 19” alloy wheels and Yokohama tyres, the high-performance wheels are made to be admired and add further to the improved handling and roadholding on offer. 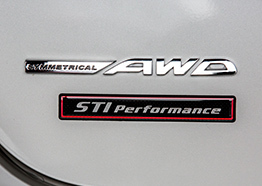 Performance badge - To give the Legacy 3.6RS its Performance credentials, the final seal of approval from STI in Japan, the STI Performance badge takes pride of place on the rear of the vehicle, making it known that this is no ordinary Legacy. 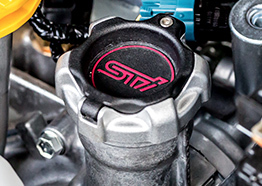 Now a name iconic in Subaru history, the STI brand started from humble beginnings to what is now a standard nameplate in the Subaru model line up and synonymous with WRC. Check out the full STI Story here. The seeds of STI were planted in 1972, when Subaru campaigned the Leone in the Australia’s Southern Cross Rally. After their first foray into competition, Subaru made history with the first AWD car entered in the World Rally Championship (WRC), when the Leone 4WD entered the Safari Rally in 1980. In 1988, STI was founded and they quickly made a powerful statement by smashing the 100,000km World Speed Record. New Zealand’s Possum Bourne worked in collaboration with the fledgling STI Japan and went on to win multiple Australian and Asia-Pacific championships. After STI’s successful start in racing, the sights were set on the World Rally Championship (WRC). Fittingly, the first victory came at the New Zealand Rally in 1993, where the STI Legacy won triumphantly. The STI team then started experimenting and landed on what would be the base of Subaru STI heritage, the Impreza STI. The success that followed was beyond anyone’s wildest dreams – 2nd overall in 1994, Manufacturers’ Titles 1995 and 1996, and a stunning 8 of 14 races won in 1997. 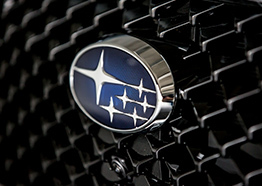 Subaru became the first Japanese company to win a Manufacturers’ Title for 3 consecutive years. With 47 WRC wins and counting, STI led Subaru to more rally wins than any other Japanese manufacturer. This success, coupled with the heroics of drivers like Colin McRae (1995 drivers’ champion), Richard Burns (2001 champion) and Petter Solberg (2003 champion), would solidify Subaru and STI among the most respected and iconic brands in the rally scene. While the Impreza STI led the way, many other production vehicles based on STI’s racing philosophy brought rally-proven technology to the masses. In 1994, the first WRX STI was released with a turbocharged Boxer engine, Driver Controlled Central Differential (DCCD) and Symmetrical All-Wheel Drive. Rally-based models continued, and the STI team created the Impreza 22B STI, with all 400 limited edition models sold out within a few days. The S201 followed, then the S202, S203, S204, S205, and S206 – all limited edition, exclusive models with the highest level of performance and workmanship available. The WRX STI is still part of the Subaru model line up today in New Zealand. 2008 marked a shift as Subaru and STI ended their WRC involvement and began a new era of racing challenges. STI started its conquest of the tarmac with the Japanese SUPER GT series. This competitive style of racing allowed the Subaru Boxer engine to prove its worth with strong finishes from the Legacy race car and then BRZ race car, which took 5 pole positions in the 2013 season. Putting their performance prowess to the ultimate test, STI also raced in The Nürburgring 24-Hour race in Germany. At a race where only the most resilient cars and drivers prevail, the STI Nürburgring Challenge race car succeeded in 2011 and 2012, earning class victories. The sixth-generation Legacy 3.6RS has evolved to be one of the most powerful production Legacy models yet, and the STI brand continues to be refined to embody some of the most iconic technology seen on both gravel and tarmac. The Legacy 3.6RS with STI Performance kit brings the best of both worlds combining power and sophistication, taking the it to the next level and beyond. Contact your local Subaru Authorised Dealer now to find out more about the Legacy 3.6RS with STI Performance.